Available as a sedan or 5-door hatchback, the value-packed 2018 Kia Rio boasts a larger interior than its diminutive size would suggest. It offers a generous serving of tech-savvy features and the best warranty in the segment. All-new for 2018, the Rio offers an attractive, quiet interior, a comfortable ride, and an expansive array of safety features. The Kia rio is a great, small car to drive short or long distances. The Kia rio is a great small car for daily use. It is good on gas and I spend about $20 a week to fill it up, and I can drive a 2. 5 hour trip which will only use about half of the tank. The radio is touch screen and it has access for an AUX cord and USB device to charge your phone or any other devices. The only downside to the specific model I have is that the windows and side view mirrors are manual, and I must lock the car through the driver's side manually. My Kia Rio is comforting and soothing. There are no problems with my car except for the fact that there is no CD slot but that is the least of my worries. It runs smooth and fast and it is very comfortable. I feel great whenever I drive my car. It has a touch screen so it helps me by not physically using my phone for whenever I receive a call. I love it. It is the ideal vehicle for gas and maneuvering around the city. I have no problems. This car has great performance just little space. Steering wheel control features and eco gas option that helps you save on gas in traffic especially. This car is easy to maneuver. Trunk space is descent also. It's a great car for a college student or a single mom with one kid or no kids. 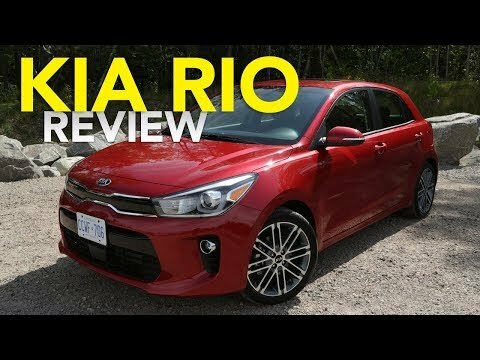 2018 Kia Rio First Drive Review In 4K UHD!